The Saul Good Gift Co. recognized the potential of e-commerce early but had issues connecting inventory management, client management, and e-commerce management systems. When your main season is four weeks, there is not a lot of time to have manual processes and orders need to arrive on time. Lack of integrated systems meant that the web store had to be taken offline early and all orders had to be taken over the phone to confirm availability. The other challenge was that key accounts were managed with direct relationships and tracked through Salesforce. Online orders had to be entered into Salesforce and accounts could not purchase on account online. In 2017 Saul Good Gift Co. expanded to Toronto, Ontario adding a second warehouse to fulfill gifts locally. We updated the design, added Canada Post address completion, and added handling for a second warehouse. Saul also rolled out same day shipping in the GTA and Greater Vancouver area. Salesforce controls the clients and accounting, a third party Salesforce app manages the inventory and the complex rules around availability of baskets made up of many parts, and CommerceCM creates a responsive, easy to use e-commerce solution that ties them all together. CommerceCM was built to connect. We know our place and have focused on providing great online solutions for e-commerce merchandising and marketing. We will never replace Salesforce and we don't have to. Our integration for Saul Good gets availability of baskets and updated customer details on a regular basis from Salesforce passing in orders as they happen. One of Saul Good's challenges with his previous website was a lack of continuity between the software and the designer. Saul Good's website now runs on ideaLEVER's powerful eCommerce platform, CommerceCM. Not only do we fully support Saul Good during the life of our relationship, he also benefits from continuous upgrades to our software that results in higher conversion rates, top-level security, and happier customers. Key accounts have access to custom products that they can purchase online when logged in with an approved account. Multiple users from one organization even share address books and can see who is buying gifts for whom. By making it easier to order and manage bespoke gifting, Saul Good Gift Co. becomes the first choice for corporate gifts. Saul Good Gift Co. knew what they wanted and what they needed to do to get to take their business to the next level. 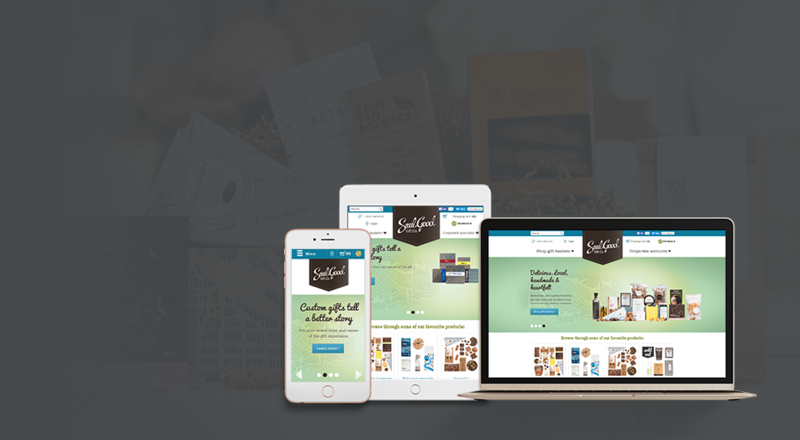 By choosing CommerceCM they were able to create an e-commerce experience for their customers as unique as their gift baskets. Choosing an e-Commerce platform is about more than just a catalog and processing transactions. We have done A/B tests to help Saul increase conversions, and even helped him redesign his processes to make printing, picking and packing easier.